Deus Ex: The Fall will be updated to run on jailbroken iOS devices because "it's the right thing to do." It came to light yesterday that the iOS-exclusive Deus Ex: The Fall was designed to keep weapons from firing on jailbroken iPhones and iPads. 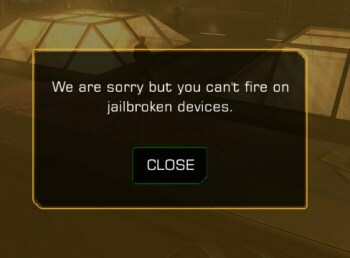 A pop-up message informing players that they "can't fire on jailbroken devices" made it clear that this was not a bug, it was DRM. The reaction to this unpleasant surprise was about what you'd expect, especially since neither Eidos Montreal nor Square Enix had seen fit to warn buyers that the game wouldn't run on jailbroken hardware. Responding to that outrage, Square Enix said today that it will issue a patch to remove the restriction - not because it was a bad idea from the get-go, but because it failed to give people the heads-up about it. "We have not been clear in our communication earlier this week when we launched Deus Ex: The Fall. We did not state clearly that the game would not support jailbroken devices and so we will be switching this off via an update, so that all the supported iOS devices will be able to play the game in the near future," Square Enix said in a statement. "We feel it is the right thing to do in this situation and apologize for any inconvenience this may have caused," it continued. "No customer should be out of pocket when we were not clear from the start, so we'll get the game updated as soon as possible so that everyone who wants to play Deus Ex: The Fall can do so regardless of whether their device is jailbroken or not." The company didn't say when the update will be available but promised to announce its release via "Eidos Montreal Community channels."